In the diocese of Lanzhou (Gansu), a priest was transferred with an order not from the bishop but from the local Department for Religious Affairs. Yet there are those who continue to defend the concept that the Church in China "is independent". The risks for the Church and for the Sino-Vatican agreement. 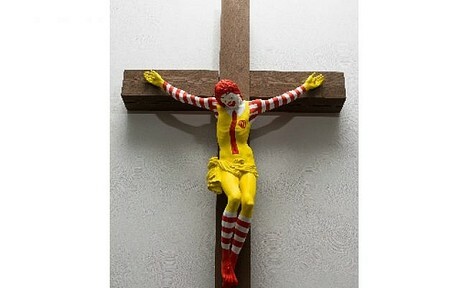 Beijing (AsiaNews) - The episode of the artwork depicting the Ronald Macdonald clown crucified like Christ exhibited at the Museum of Haifa has similarities with what happens in the diocese of Lanzhou (Gansu), where a priest was transferred not on the orders of the bishop, but from the local office of the Ministry for Religious Affairs. The author, the famous blogger Shan Ren Shen Fu, sees a danger in this: that the Church in China is not "independent" (as it often claims), but in reality is "dependent" on the government. And this risks being a problem also for the new interim agreement between China and the Holy See: "When the Pope said that the Church does not interfere in the life of the country, does he mean that the affairs of the Church can be safely "conducted" by the government?". The museum in Haifa (Israel) exhibited a work of art (pictured) last August by Finnish artist Jani Leinonen. In the creation the artist replaced Jesus, known to all, with the equally famous clown that is seen at the door of every McDonald’s '. It’s not very clear to me what Leinonen wants to express with this work (I cannot see anything), and I do not even dare to say that it is only a "parody". It is true that most people do not understand the meaning of art and even enjoy this not understanding to a certain degree. Besides looking on in silence and seriously admiring the work, the reality is that they cannot open their mouths to say something at random, for fear that their secret will be revealed! But Christians who live in Israel have raised their protest. They claim that this is an "insult" to the Christian faith and have asked the Israeli government to implement a policy of greater tolerance for religious beliefs, which does not allow this type of behavior so provocative and offensive to religions. The incident created a lot of discomfort in Jani Leinonen: as an artist he did not think that his work posed any problem. It was even more surprising that the Haifa Museum continued to exhibit the piece, despite the agreement for its early withdrawal. Therefore, Jani Leinonen is baffled by the controversy caused by his work. What should not happen, happened. Perhaps it is Christians who do not understand the meaning of this work of art, or it really offends religion; or it is the Museum of Haifa that uses it on purpose to tease the nerves of Christians, or it is Christians who are always a little too sensitive. In short, whatever the motivation, because of this problem, Christians living in Israel are expressing their disappointment. A religious leader said: "If such a thing happened in Europe, it might not be a big problem, but in Israel - the land sacred to the three main [monotheistic] religions - the fact takes on greater importance". Others say, "If these works touched the religious sensibilities of Muslims and Jews, they would be banned forever, but as far as Christians are concerned - only a little more than 175,000 in Israel - they do not care so much about it." 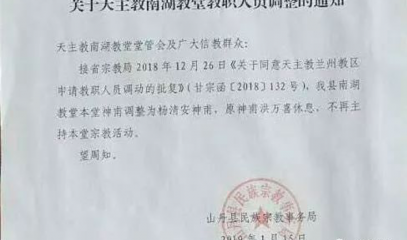 The diocese of Lanzhou (Gansu) recently issued a strange "Order of the transfer of priests", later posted on the wall of the church of Nan Hu (see photo 2) This decree has obviously caused a lot of unrest. 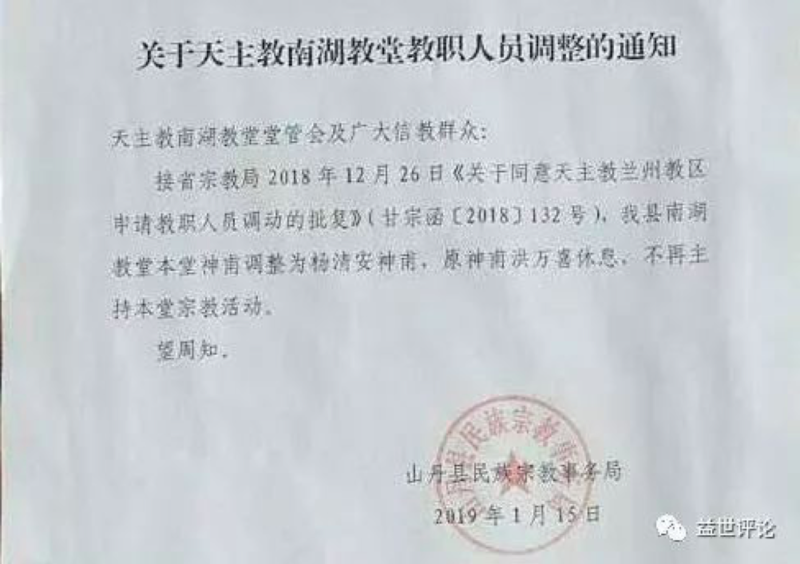 Shandan County Religious Affairs "issued the order for the transfer of the priests of the diocese of Lanzhou and publicly exposed it on the wall of the Church: this is the first time that such a thing has happened. This move has some similarities with the McDonald clown. Art is at a higher level; the order of transfer of a priest is not an equally noble question. Education to the faith and the movement of priests have always been the tasks of the bishop of the diocese (or, in the absence of the bishop, of the diocesan administrator). By chance the bishop of Lanzhou with his official settlement also handed over his responsibilities as a bishop to the government? Furthermore, the separation of politics and religion is still China's basic national policy: although the interference of the government in Church internal affairs is not new in China, the decision to move a priest is unprecedented. I try to guess: maybe it's because the bishop cannot do it, so he asked the government to come forward. The movement of priests, we know, has never been a simple matter: there is a lot of work to do in a discreet way, until its completion or the impossibility of transfer. But you cannot ask the Department of Religious Affairs to directly issue an order to move priests (even more astonishing is the decree issued by the Shandan Religious Affairs office). Last year, an official priest was removed from his position by the local government and I do not know how the story ended. Earlier this year, local Shandan government authorities issued a decree to move priests, which is really embarrassing. If indeed a Chinese bishop can now transfer this power to the government, then in the future the Chinese Church cannot be said to be independent of the Government. The bishop becomes a courtier and the priests his supporters. Although after the agreement [China-Vatican] the Chinese government recognized the Pope as the supreme leader of the Chinese Catholic Church, in order to maintain this recognition and the full hard-won communion, the Pope also recognized that the current situation of the Chinese Church remains a problem. The Pope, however, does not speak of hostility and promises that the Church will not interfere in the life of the country. For this reason, when the scholar Liu Guopeng states that the government speaks of "independence and self-management", of "permanent provision" [of the influence of the Party in religious life], and of "shelving" [of the persecutory past], all this seems to no longer have so much importance. 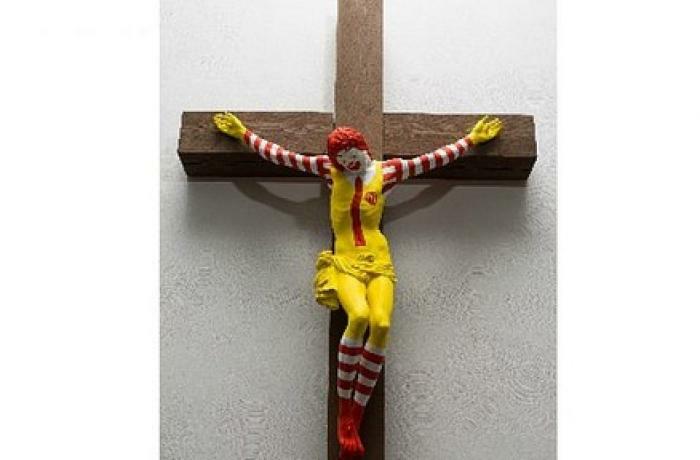 When will the Church in China come to understand that the "person" on the cross is irreplaceable, even if it is replaced by McDonald's clown? When it accepts that the office for Religious Affairs decides to move a priest, is it not leveling the life of the Church to that of the country? When the Pope has said that the Church does not interfere in the life of the country, does it mean that the affairs of the Church can be safely "conducted" by the government? For example, choose who the bishop will be, who the parish priest will be, or who must be removed from his office! The Pope approves, the government executes, the bishops obey, the priests support the bishop, the faithful execute the orders ... It is only a matter of time, of hours until the Chinese Church is transformed into a great company! If so, why does the Chinese government still need the rhetoric of "independence and self-management"?